Park Place in Myrtle Beach, South Carolina is an active lifestyle community that boasts low-maintenance living in a beautiful coastal setting. Beazer Homes is building this cozy community of 88 homes that offer waterfront or wooded views. 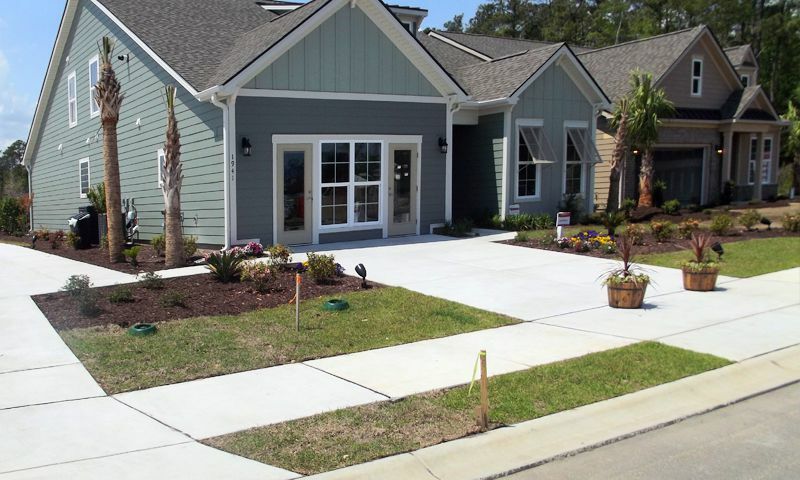 Residents will enjoy low-maintenance homes, a community pool, pavilion, and a convenient location just minutes from the scenic beaches of Myrtle Beach. Residents will enjoy spending time at the community's proposed pool and adjacent patio, which is slated to be complete by the end of 2017. A pavilion and a scenic pond will provide an idyllic setting for picnics and outdoor gatherings. A homeowners' association will manage grounds maintenance and lawn care, leaving residents more time for hobbies and leisure activities. Park Place will have 88 single-family homes when completed. Homebuyers can chose four semi-customizable floorplans ranging in size from 1,705 to 2,690 square feet. Designed by Beazer Homes, these single-family dwellings will have three bedrooms, two or two-and-a-half bathrooms, and attached two-car garages. Most floorplans are single story with optional second floors that allow homebuyers an extra bedroom, hobby space, or storage. Homebuyers can chose optional layouts like his and hers walk-in closets and two unique kitchen configurations. These energy-efficient homes are built on homesites with a waterfront or wooded view. Situated just two miles from the Atlantic Ocean, Park Place offers an ideal and convenient coastal location in Myrtle Beach, SC. Marketplace Commons, a large retail development, is less than a mile away, or about a twenty-minute walk. Here, residents can find retail stores, banks, a yoga studio, and a number of great restaurants, including local favorites like Tupelo Honey. Days at the beach are easy and convenient with Myrtle Beach State Park and the Atlantic Ocean less than two miles away. Those who frequently travel or have out-of-town guests can appreciate having Myrtle Beach International Airport only minutes away. The Myrtle Beach area also has local hospitals, entertainment venues, and cultural attractions. Park Place is a great active lifestyle community in Myrtle Beach, South Carolina. Check back soon for more information on the lifestyle in Park Place. Designed by Beazer Homes, these single-family dwellings have three to four bedrooms, two to three bathrooms and attached two-car garages. Most floorplans are single-story with optional second floors that allow homebuyers an extra bedroom, hobby space, or storage. 55places.com is not affiliated with the developer(s) or homeowners association of Park Place. The information you submit is distributed to a 55places.com Partner Agent, who is a licensed real estate agent. The information regarding Park Place has not been verified or approved by the developer or homeowners association. Please verify all information prior to purchasing. 55places.com is not responsible for any errors regarding the information displayed on this website.